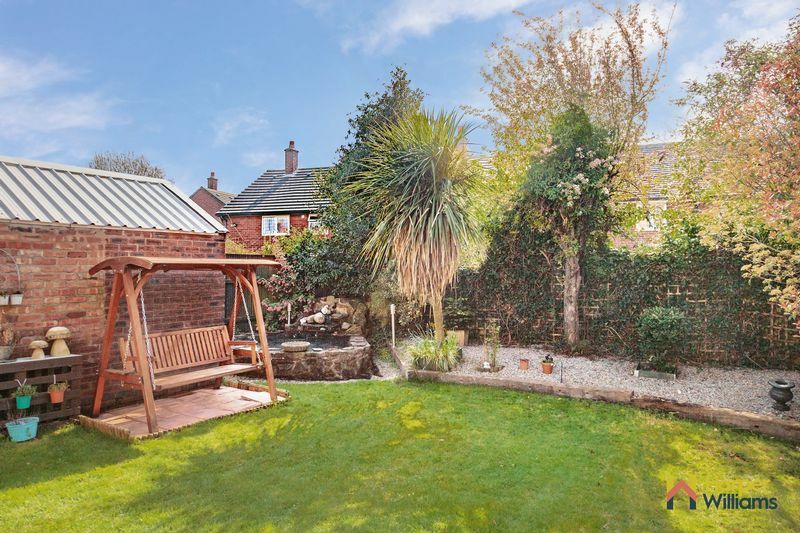 A very charming and picturesque 1930's bay fronted detached property, situated along the ever popular Myddleton Lane in the heart of Winwick village. 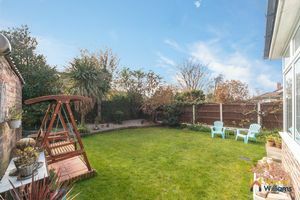 These properties rarely come to the open market, and when they do, they get snapped up quickly - so registering your early interest is highly recommended! 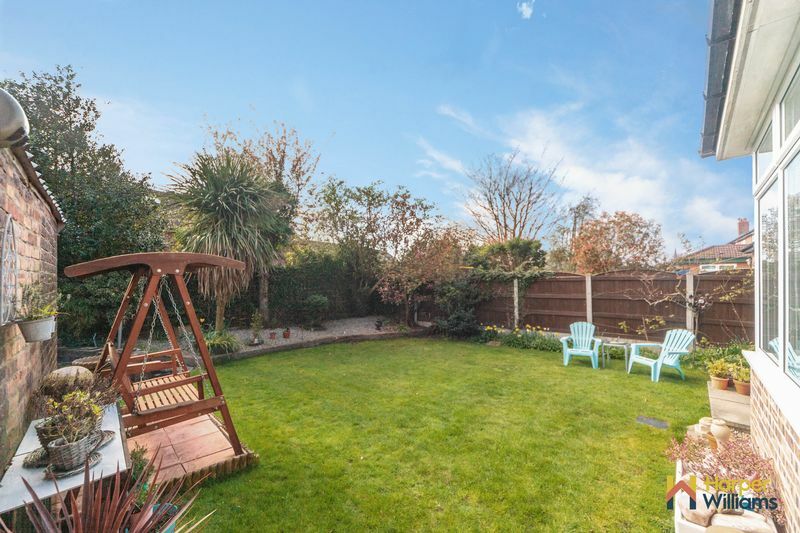 This beautiful detached residence occupies a stunning plot, which is set back from the road and includes a feature turning circle driveway and well established borders for even more privacy. Just as impressive on the inside as aesthetically pleasing it is externally, the internal accommodation comprises an entrance vestibule, ground floor shower room/ utility, an open plan kitchen and dining room with double doors into the conservatory, a cosy sitting room with a fabulous wood burning fire and a formal lounge with a feature bay window to the ground floor. 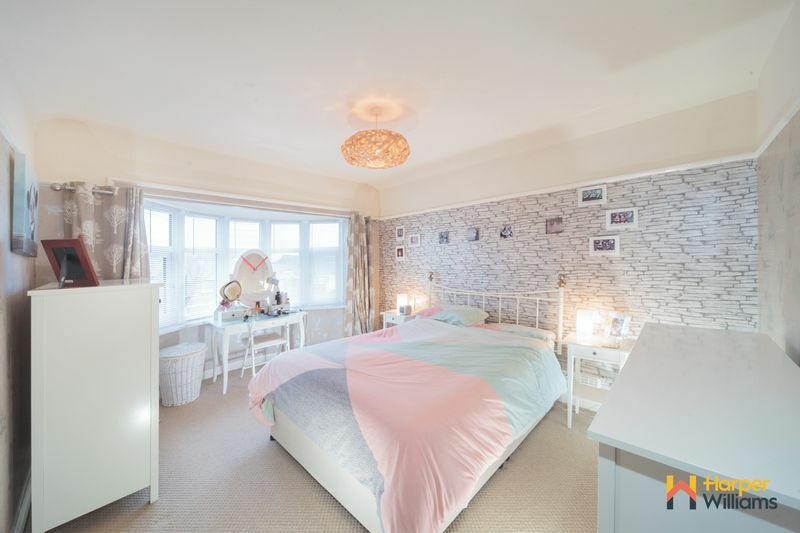 To the first floor, there are three bedrooms, the master bedroom benefiting from another large feature bay window - the main signature of these 1930's era properties and a contemporary family bathroom to the first floor. 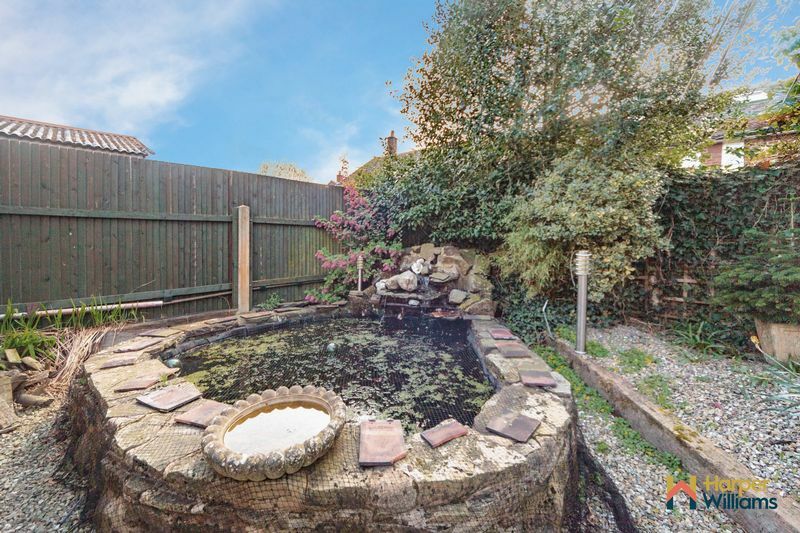 There is a low maintenance garden to the front with decorative well stocked borders and a horse-shoe driveway, and to the rear a fully enclosed private garden which is laid mainly to lawn with a separate patio area, feature pond and a single detached garage, ideal for outside storage. 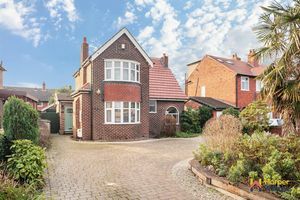 Ideally located in the quaint village of Winwick close to excellent schooling options and fantastic transport links via the M6 and M62. 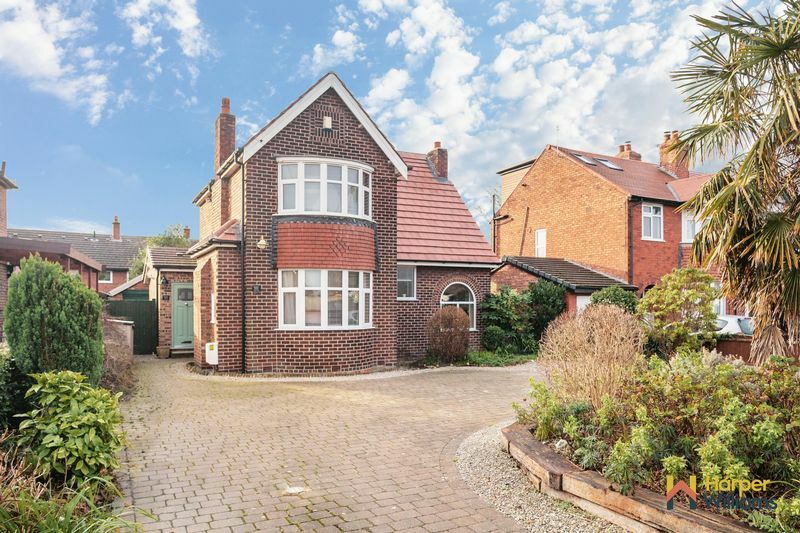 Offered for sale with no upward chain, early viewings are highly advised to avoid disappointed! Entrance via a composite entrance door, with tiled flooring, central heating radiator, ceiling light point and doors into the shower room/ utility and door into the kitchen. A country style kitchen fitted with a range of light oak effect wall and base units with complementary worktops over, incorporating a range of integrated appliances, including a stainless steel sink with a mixer tap and drainer, cooker with a 5-ring gas hob with a stainless steel extractor hood over, oven and grill, plumbed for dishwasher and integrated fridge and freezer. Complementary tiled floor and contrasting part tiled walls. Stylish chrome verticle radiator. Two ceiling light points. 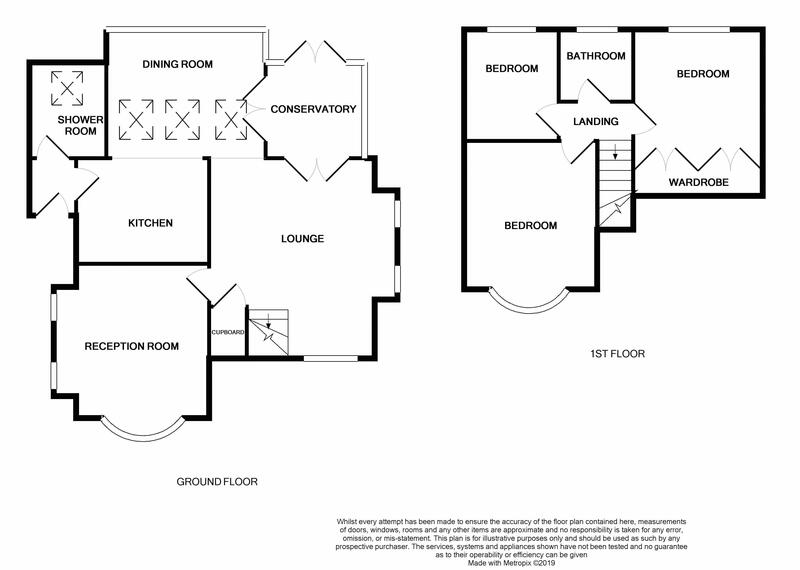 A great addition to the ground floor space, fitted with a three piece suite in white comprising a tiled shower cubicle, low level WC and pedestal wash hand basin. There is plumbing for a washing machine and a wall mounted combi boiler. Tiled flooring, ceiling light point and double glazed window to the rear aspect with an additional velux window allowing plenty of natural light. 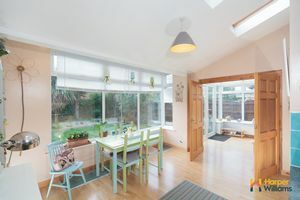 A lovely dining area which is very light and airy with a large uPVC double glazed window to the rear aspect with three further velux windows, laminate flooring, central heating radiator, spotlights and three feature downlighters. Double doors into the conservatory and opening into the sitting room. 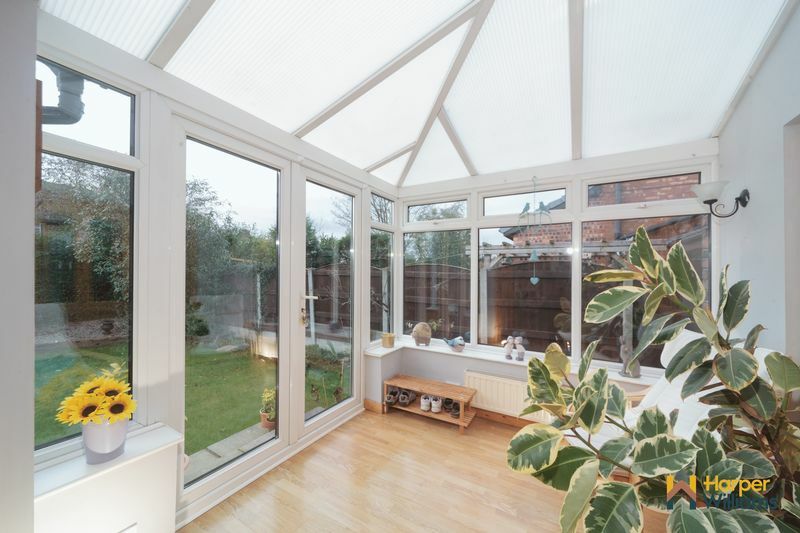 A lovely sun room with is very private not being overlooked, with a patio door opening onto the rear garden, wood laminate finish flooring, two wall lights and warmed by a central heating radiator. A spacious yet cosy sitting room with a fabulous exposed brick fireplace into the chimney breast housing a wood burner with a wooden mantel and two feature stained glass window to each side with a display shelf above with spotlights underneath, making this a wonderful focal point for this room. 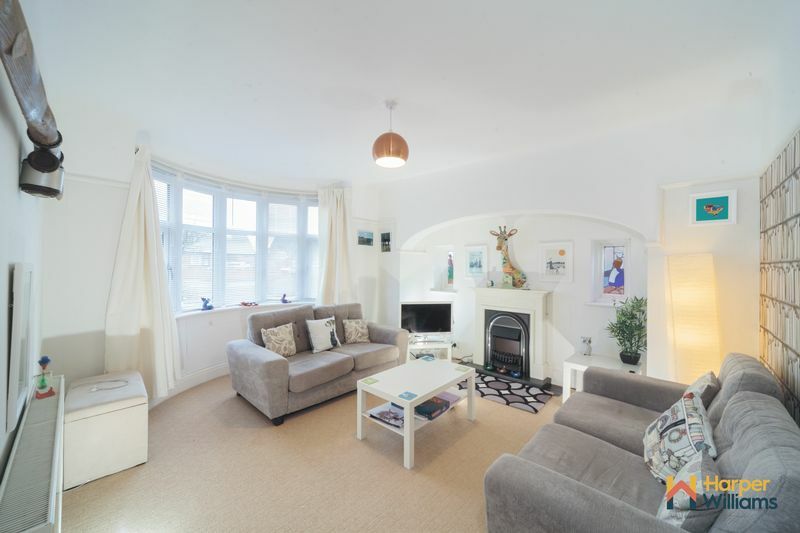 This is a very light and airy reception room with a feature arch uPVC double glazed window to the front aspect and uPVC double glazed doors opening to the conservatory. 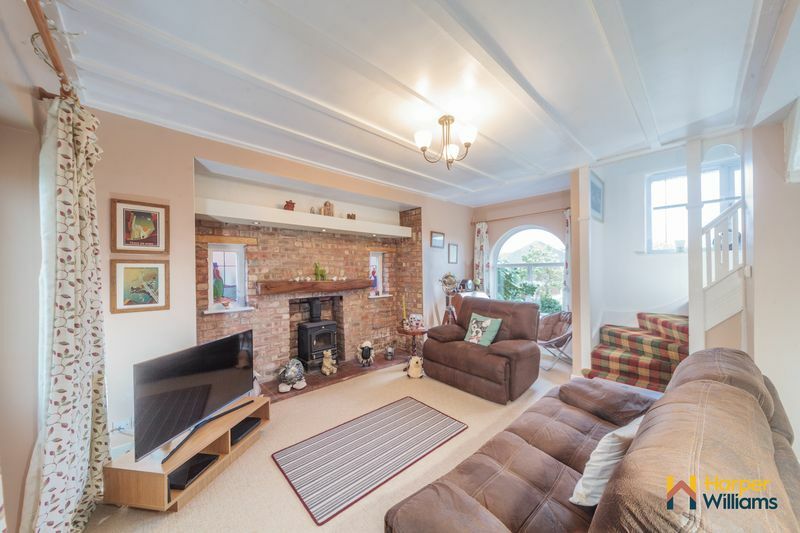 Staircase rising to the first floor with understairs storage and the room is warmed by a central heating radiator. Another impressive reception room with a stunning large uPVC double glazed bay window to the front aspect and a beautiful feature inglenook fireplace housing a contemporary electric fire with a white surround and granite hearth and lovely stained glass uPVC double glazed windows to each side of the fireplace. Warmed by a central heating radiator and with a ceiling light point. 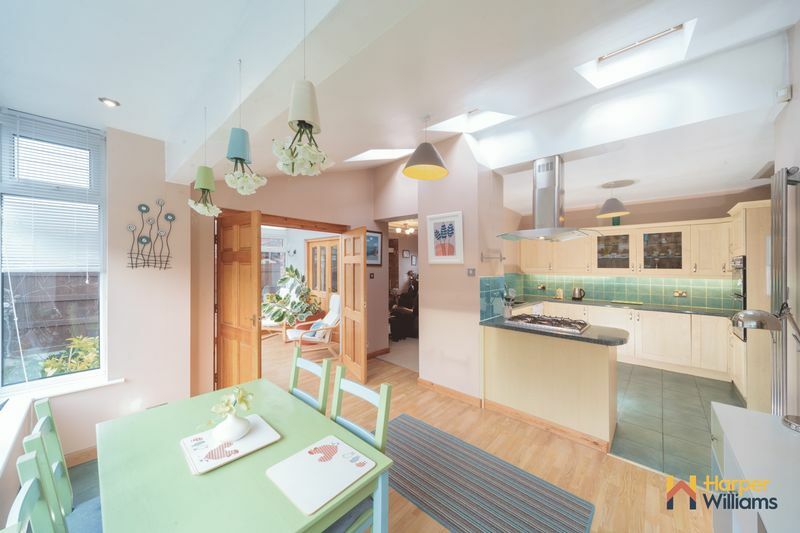 A light and airy landing with a window to the front aspect as you walk up the staircase, with a ceiling light point and access to the loft area. 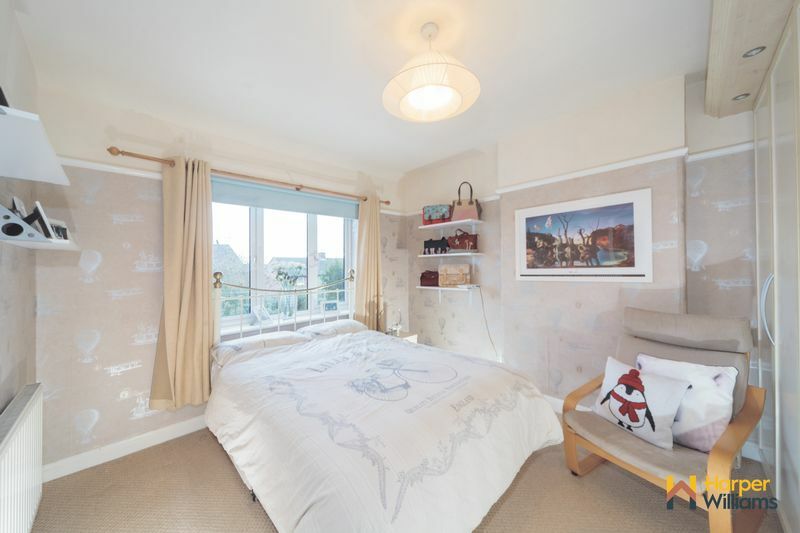 A great size double bedroom which is bright and airy with another stunning large uPVC double glazed bay window to the front aspect, central heating radiator and ceiling light point. 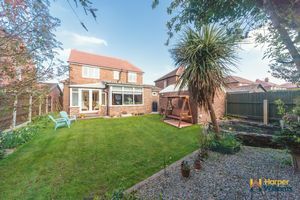 Another good size double with a large uPVC double glazed window overlooking the rear garden, with built in wardrobes, central heating radiator and ceiling light point. 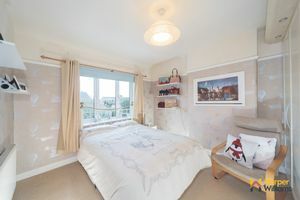 A decent third bedroom with a uPVC double glazed window to the rear aspect, warmed by a central heating radiator and with a ceiling light point. 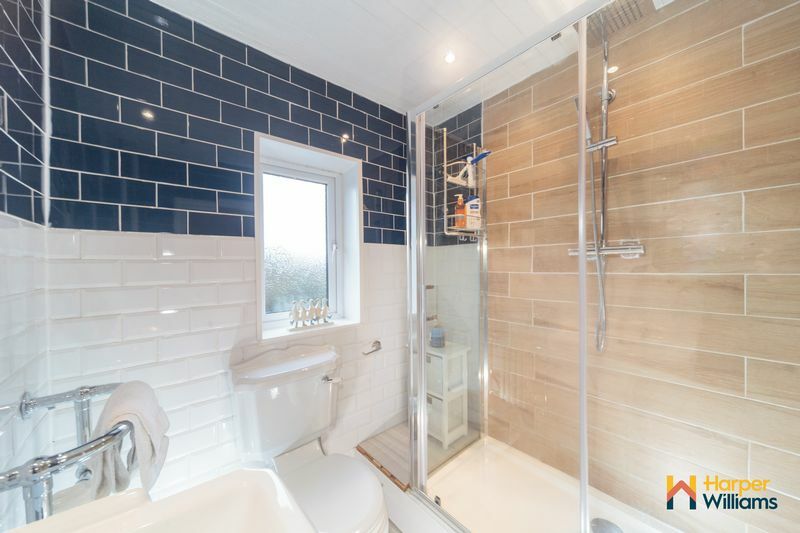 A contemporary bathroom fitted with a three piece suite in white with chrome fittings comprising a double tiled shower cubicle, low level WC, pedestal wash hand basin and a Victorian style radiator with a chrome towel rail. There is a uPVC double glazed frosted window to the rear aspect, stylish tiling to the walls and floor with underfloor heating and spotlights to the ceiling complete the modern look. 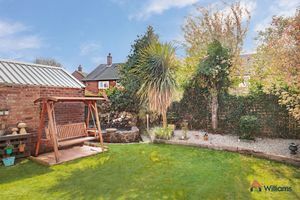 Occupying a prime plot, to the front of the property, there is a low maintenance garden with decorative well stocked borders and a horse-shoe driveway. To the rear, there is a fully enclosed private garden which is laid mainly to lawn with mature trees and borders, with a separate patio area perfect for 'Al Fresco' entertaining, feature pond and a single detached garage, ideal for outside storage.